Underwood’s Hall was located on the third floor of a building (left) that stood, until destroyed by fire in 1881, where the Willowbrook Emporium is now situated. On January 10, 1851, it hosted a meeting of farmers and friends of agriculture. 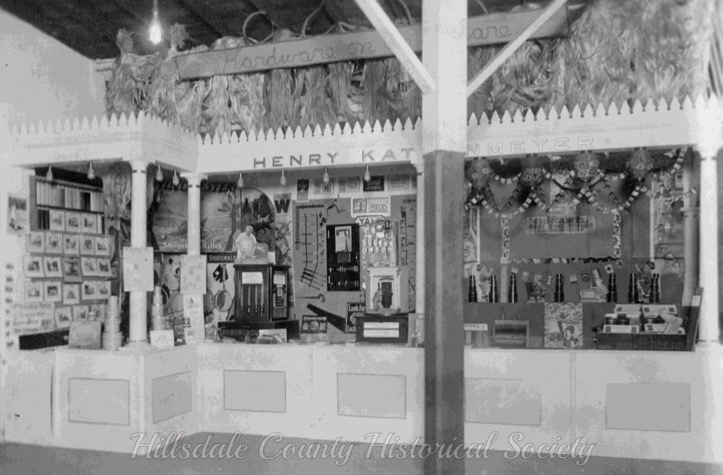 The purpose was to organize the “Hillsdale County Agricultural Society,” which would establish a yearly Hillsdale County Fair. Henry S. Mead, a member of the State Legislature, presented the Constitution and By-Laws of the new Society at the end of September in the same year, and the first annual Hillsdale County Fair was set for two weeks later, October 15 & 16, 1851.
the fair horse races in 1913 were a huge attraction. today they no longer are run. That first year there was no admission fee, so the organizers hustled to raise subscriptions. A grand total of about a dozen cattle and several horses were tied to hitching posts on Courthouse Square near the newly erected Courthouse. They were the stock exhibits. Inside the Circuit Courtroom the ladies exhibited needlework, bread, butter, and jam. Not surprisingly, less than $80 covered all the premiums that year. Newspaper accounts of the event outdid themselves with elaborate prose, declaring the event was “beyond expectation for the first agricultural fair in Hillsdale County,” (thus demonstrating that “spin” is hardly a modern concept). The next year Jonesville was the site of the Second Annual Hillsdale County Fair. The organizers chose the public square as the site and erected a fence, requiring everyone attending to pay an entry fee. In 1853 it was back to Hillsdale, where one acre at the corner of Union Street and Vine Street was leased... with a fence and entry fee. Jonesville upped the ante in 1854, when it was their turn to host the Fair. Land was leased, a short track for horses was cleared, and the most successful Fair yet saw 500 entries and $400 in ticket receipts. Hillsdale’s turn came around again in 1855, and the challenge to outdo the Fair of the year before was met. The dense wilderness in the southeast corner of the city of Hillsdale was leased amid serious doubts about whether enough land could be cleared in time for the Fair. It could be and it was. The rotation from Jonesville to Hillsdale and back again continued until 1859, when a decision was made for a permanent Fairgrounds... in Hillsdale. John Potter Cook and Chauncey Washington Ferris happened to have the perfect piece of land... a wilderness of scrub oak and brush within a mile of the Courthouse. It encompassed the area where Jeremiah Arnold, the first white settler in what would become the city of Hillsdale, built a home in 1834. This was also the spot where the Howder Tavern had been located. Cook and Ferris were willing to sell the seven acres on the south side for $50/acre and an additional ten acres to the north of that for $100/acre. Understandably, the Jonesville members of the Hillsdale County Agricultural Association were aggravated to be shut out of the Fair rotation. They responded by having their own Fair for ten more years, called the “Farmers, Mechanics, & Stock Breeders Association.” The stockholders of the Jonesville association eventually sold their land for the Lansing and Jackson branches of the Lake Shore and Michigan Southern Railroads and threw in their lot with the Fair in Hillsdale. Floral HALL, one of the earliest Fair Buildings, constructed in the late 1860's, was built in the form of a cross. It later became known as the old merchants' hall. In 1861 there was a noticeable dearth of young men in Hillsdale County; the Civil War had claimed not only the men but also the financial resources for the Hillsdale County Fair. Such small payments of the lease for the Fair land were made to Mr. Cook and Mr. Ferris that it should have been forfeited. Never-the-less, Cook and Ferris renewed their contract with the Hillsdale County Agricultural Society, adding an additional eight acres to the Fairgrounds. Cook and Ferris were proved right in their optimism about the Fair when the War ended and 1865 saw the best Fair yet. A race track and fenced grounds were added that year, to be followed the next year with a dining hall and the Floral Hall (left and now known as the Merchants’ Hall). In 1879 another ten acres was added to the Fairgrounds, and Broad Street was curved to the west to accommodate the addition. The Entrance to the fair in the early 1900s is still used today ... without the wooden archways. The fair office was originally on the hill to the left rear of the picture. it’s now the hillsdale county historical society museum. As early as 1879 the hillsdale college herald was lauding : … the success of our county fairs.” particularly interesting to the college crowd was the collection of artwork displayed by arious college professors. In 1869, because of the financial and social success of the Hillsdale County Fair, $3000 was spent for cattle sheds, the “new” dining hall, and a dwelling for the grounds keeper located at the Broad Street entrance. Over the years that dwelling has been used for offices of the Fair Association, a restaurant during the Fair, rental property, and for storage. In 1972, the Hillsdale County Historical Society arranged to lease from the Fair Association that “Little White House on the Hill” to use as their museum. The Hillsdale Woman’s Congress was founded in 1897 as a way to bridge the worlds of urban and rural women. Initially the cultural events organized by the ladies were held in a tent with the Fair going on full blast around them... not the ideal acoustics. Eventually the ladies, having proved their staying power, were allowed to use an old hen house as their Woman’s Congress building. The hens (and their refuse) were removed and the ladies effected many positive changes through the years. The Hillsdale County 4-H Club was begun in 1914. Probably because we have always had a strong rural presence in Hillsdale County, it grew rapidly, requiring a large tent to house its exhibits during Fair Week. When even that was insufficient, a 4-H building was constructed, the first in the country. In 1947 a stock barn was erected near the 4-H Building and then expanded in 1948. Sadly, in 1961, the building burned and a new building was built on the same spot in 1962. With 2008 premiums of over $124,500 and attendance over 175,000, we’ve come a long way since the modest beginnings of the Hillsdale County Fair in 1851. The two-week preparation for the first Fair was tame compared to current planning that begins in May. But a faint echo of the past is present when the ladies of the Women’s Congress don their period garb for their annual meeting, as well as in the “Little White House on the Hill,” where the past is in review. There you can see key moments in the history of Hillsdale County: the post office used by J.P. Cook, where he charged the receiver, not the sender, for postage (an ill-conceived idea that was soon jettisoned); pictures of eloping lovers, Art Smith and Amy Coeur, who were married in bed at the Smith Hotel where they were recovering from the crash of Art’s plane; the chair Chief Baw Beese considered his own when he visited a local settler; an oar from the “Four Oarsmen” who, after winning the National American Rowing Championship for three years, were sent to England by the National Association of Amateur Oarsmen where they took on (and lost to, due to a broken seat) the best amateur oarsmen of England; and kitchen utensils and clothing that document the passing of the years. “The Most Popular Fair on Earth” may be hyperbolic, but for the residents of Hillsdale County... and many others who come annually from further away... it is a yearly ritual that cannot be missed.